Let’s see who the baddest cat in the place is! Show up and help me (rev) celebrate 35 years on this planet….then off to the next one! WE ARE CURRENTLY AT 127 REGISTRATIONS. The time is nearly nigh for the 2nd Annual Portland Pinbrawl. So, bone up on your skills – your pinball skills, your pre-registration skills, and your metaphor skills – because soon you’ll be punching suckas in the face left and right, via your scores being higher than theirs. Ground Kontrol – 511 NW Couch St.
Machines: There are a lot lot of them. Check the GK site or the Portland Pinball Map for the list. Note that this year it’s going to start a little earlier. 11am SHARP. Very sharp. There will be two mini-tournaments happening during the main event, run by your favorite hometown heroes, CFF! The mini-tournos will be a split-flipper tournament, and a one-handed tournament. The split-flipper will be on Viking. The one-handed will be on Dr. Who. There will be a food cart nearby for tasteful all-day grub. The format for the main event is 1 on 1, best 2 of 3, double elimination. The grand prize is a Johnny Mnemonic DVD Pinball Machine! 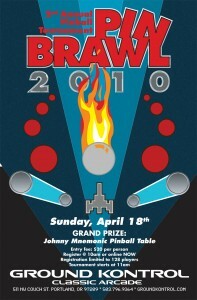 Stay up to date with Ground Kontrol’s Pinbrawl blog posts. Also, click that link to pre-register. Okay then, see you then! Don’t forget to try your hardest! Have you ever thought about how in the future you could have a big list of nearby pinball machines… listed on your phone? Good – glad you’ve thought that. It’s a great thought to have. Well, ladies and everyone, that future is technically NOW. 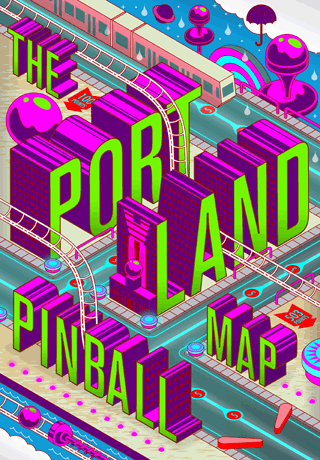 Introducing the next step in advanced technology: the Portland Pinball Map iPhone App. Art by Drew! UI by Isaac!! Consultation fees and extensive kickbacks awarded to ROM and SSW!!! Yea!!!! Updates will be rolled out. Feedback is encouraged. GO HERE FOR MORE INFO (INCLUDING SCREENSHOTS), AND TO ACCESS THE APPLE ITUNES STORE.